Rocco’s Pizza is a small restaurant in Branson that serves up the finest Italian flare with beautiful ambiance and delicious dishes. Dining in Branson can be enjoyed best at Rocco’s Pizza as every dish served here is created using only the freshest and finest ingredients. Everything offered in this Italian restaurant is hand-made, hand tossed, and hand delivered. They serve only the freshest vegetables, finest meats, and breads that are baked fresh daily and made from their own homemade doughs. Rocco Palazzolo is the man behind the success of Rocco’s Pizza. Rocco come from a small town of Cinisi in Sicily. He migrated to the United States in 1968 with a small amount of money that his father raised by selling a cow. At the time Rocco set foot in the US, he landed in New Jersey and met a fellow countryman Nicola. In 1969, the two worked together and opened a pizza shop in Trenton, New Jersey selling Tomato Pies. After gaining first profits, Rocco paid his father back home for the cow. Eventually, Rocco bought out his friend and opened a second shop. When Rocco got homesick, he returned to Sicily until 1979 and returned back to the United States with his family settling this time in Hatteras, North Carolina. Rocco’s children started to work at the shop at the tender age of six years old. The children learned the business early from the ground up, putting in mind that quality and freshness were just as important as taste and appearance. Rocco’s son John followed in the family business by opening his own shop in Grandy, North Carolina when he was 25. By this time, Rocco is now semi-retired watching the success of his children. Over the next few years, the whole family, Rocco and his wife Theresa, along with John and his wife Vicey and older brother Sal and his wife Melissa moved to Branson. John is inspired with the beauty of the scenery that Branson has to offer and the nice people around, so he decided to raise his kids in this great place. As times passed by, John found a building in Republic that he and brother-in-law Travis spent five to six months renovating the place and began to introduce Rocco’s Pizza to the locals. John and his wife Vicey have fallen in love with the people around them and their extended family has grown to include many true friends. The authentic New York style pizza of Rocco’s has made a name in the Ozarks. Rocco’s Pizza has participated and won peoples Choice as best pizza at the Greater Ozarks Literacy Council’s annual Pizza Bowl two years in a row. Rocco’s also competed against many national and local pizza shops in the Pizza Bowl. During the event, there’s always a long line at Rocco’s Pizza. 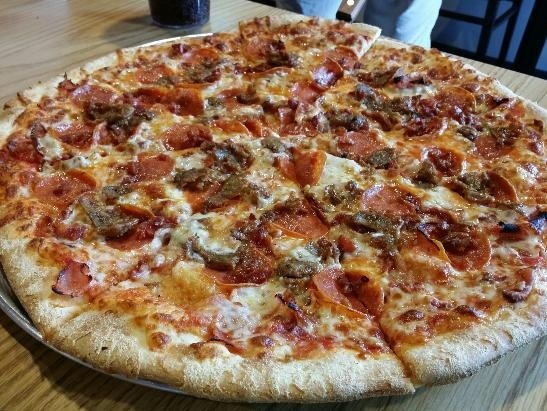 So, if you want to experience a satisfying dining in Branson with the best pizza in town, visit Rocco’s Pizza and be indulged with what they can offer.